What is an app permission, anyway? The typical Windows application you download and install from the Internet has access to just about your entire system, but applications you install from the Windows Store can be set to just request the permissions they need. These app permissions help keep your system safe and protect your privacy. 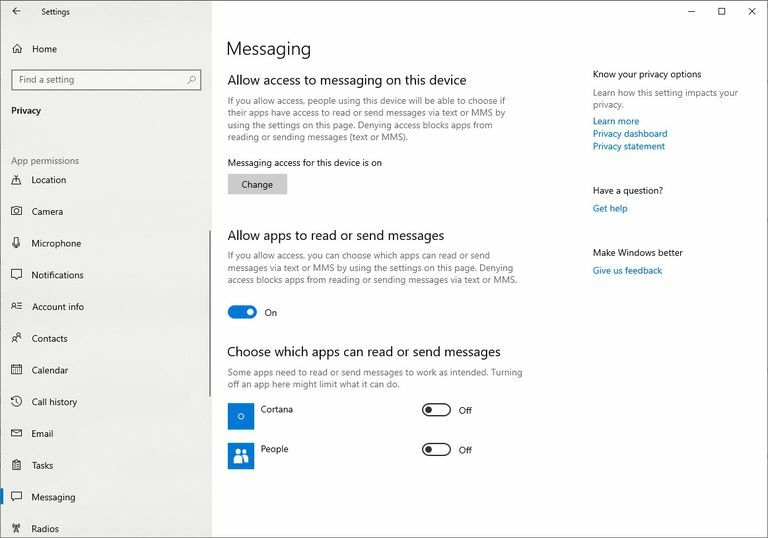 Here's an explanation of what Windows 10 app permissions are, and how to manage them. What is an App Permission? An app permission is a setting that allows a program to access a specific feature of your device. This could be a hardware feature (e.g. your GPS to determine location) or software subsystem (such as your Calendar or Picture Library). This Microsoft Help page lists all the different permissions available in a Windows 10 system, although most are self-explanatory. It's important to know which apps are using which permissions. While apps that don't have the permissions they need will ask for them, there may be apps with permissions they don't need. It's a good habit to keep an eye on these and revoke them if they're not really needed. Find and right-click the app you want in the Start Menu. This will display a the app's options in the Windows Settings tool. The screen includes a section listing all the permissions the app requires, as well as whether it's enabled or disabled for each one. You can also get here by opening Settings, select Apps & Features, select an app, then select Advanced Options. The controls in Windows Settings give you a way to turn permissions on and off either on a global basis, or per application. Open the Start Menu, then select the gear icon to launch Windows Settings, or press Win+i. A toggle switch to turn that permission on or off for all apps. A toggle switch to change the permission for each app. There are some applications that will always have access to a particular feature, regardless of your settings. The Calendar app, for example, will always have access to Calendar-related resources, and therefore will always have that permission. Select the appropriate toggle switch to enable or disable a permission for a particular app. If you happen to turn on one of the permissions while the app is already open, you may need to restart it for the setting to take effect. It's worth noting that apps don't actually ask for permissions during download from the Windows Store, and instead install regardless of whether or not they have the permissions they need. If you turn off the permissions for specific software or hardware, then install an app that needs either, the app will only ask for permission when you launch it. Simply turn the permission back on and restart the app, and it will work as expected thereafter.